Key community members come together to raise money to produce film that helps to bridge the divide. Con. 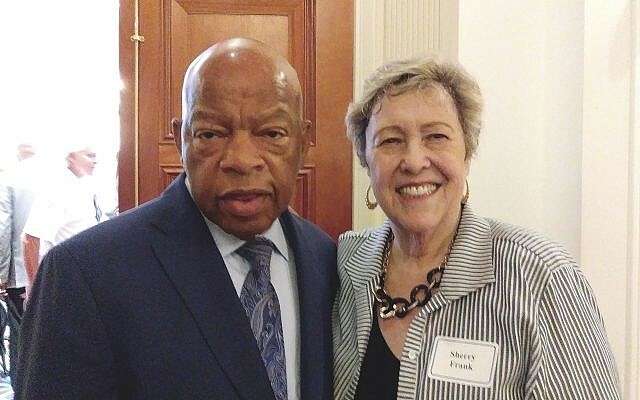 John Lewis (D-Ga.) and Sherry Frank founded the Atlanta Black-Jewish Coalition. Dr. Martin Luther King Jr. stood at the pulpit of Dexter Avenue Baptist Church in Montgomery, Ala., his voice rising like the blast of a shofar as he preached from the Old Testament. Young Jews who traveled to Montgomery to participate in the civil rights movement were moved to learn the foundation for the most pivotal moment in American history was rooted in Hebrew text. The bond between blacks and Jews during the civil rights movement is the subject of the film “Shared Legacies: Extraordinary Moments in the Black and Jewish Civil Rights Alliance.” Filmmaker Shari Rogers was inspired to document the relationship between the two communities after visiting the Charles H. Wright Museum of African American History in Detroit. There she met Clarence B. Jones, King’s attorney and speechwriter. Jones informed Rogers that King charged him with telling the black community about the “24/7 support” Jews gave blacks during the civil rights movement. Rogers decided to launch the company Spill the Honey after hearing the story of Eliezer Ayalon, a Holocaust survivor who chose to live a life of sweetness. She uses the platform to promote the shared experiences of blacks and Jews because she says it’s a part of history that goes overlooked. 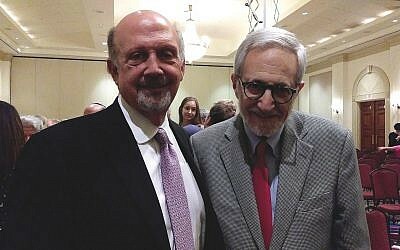 Steve Labovitz and Rabbi Alvin Sugarman at the film preview at The Temple. 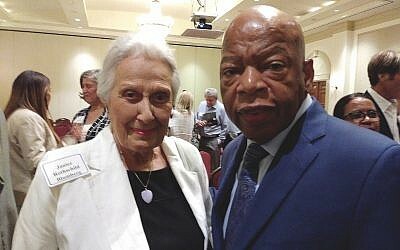 During a preview of the film at The Temple, pioneers and supporters of the civil rights movement gathered to recall how Jews and blacks worked together to end the injustice of the Jim Crow South. 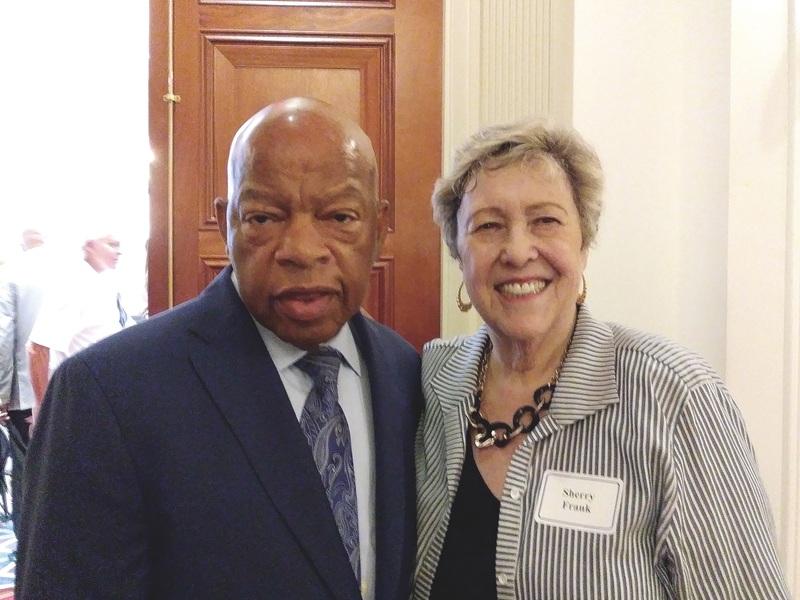 Sherry Frank, Congressman John Lewis, Rabbi Alvin Sugarman, Rev C.T. Vivian, Hank Thomas, Janice Rothschild Blumberg and others spoke to attendees about the importance of the relationship. Through archival footage and interviews, the film captures how the “Jewish presence” during the civil rights movement was instrumental in breaking down racial barriers. Rogers revealed how Jews were key in the desegregation of whites-only lunch counters because many of the department store restaurants were owned by “compassionate Northern Jews.” She identified the Jewish lawyers who fought high-profile civil rights cases such as Jack Greenberg, one of the lawyers who argued Brown v. Board of Education of Topeka, Kan., resulting in the desegregation of public schools. Scenes from Rabbi Abraham Joshua Heschel marching with Dr. King show how Jewish camaraderie was visible in the face of oppression. The film also includes the controversial dinner organized by Rabbi Jacob Rothschild and his wife, Janice Rothschild Blumberg, in honor of Dr. King receiving the Nobel Peace Prize. The event was the first public, integrated dinner in Atlanta. Rogers also takes viewers behind the scenes in Washington, D.C. to show how the power and influence of Joe Rauh, Marvin Caplan and Arnold Aronson led to the passage of the Civil Rights Act of 1964. Janice Rothschild Blumberg and Con. John Lewis (D-Ga.). And although there was already a hidden coalition between blacks and Jews, Lewis said he and Frank founded the Atlanta Black-Jewish Coalition because they wanted to make it official.